The world appears to be in a remarkably precarious situation right now – in fact, so extreme has our devotion to false idols become that we have ended up with a trumped-up reality star running for president. 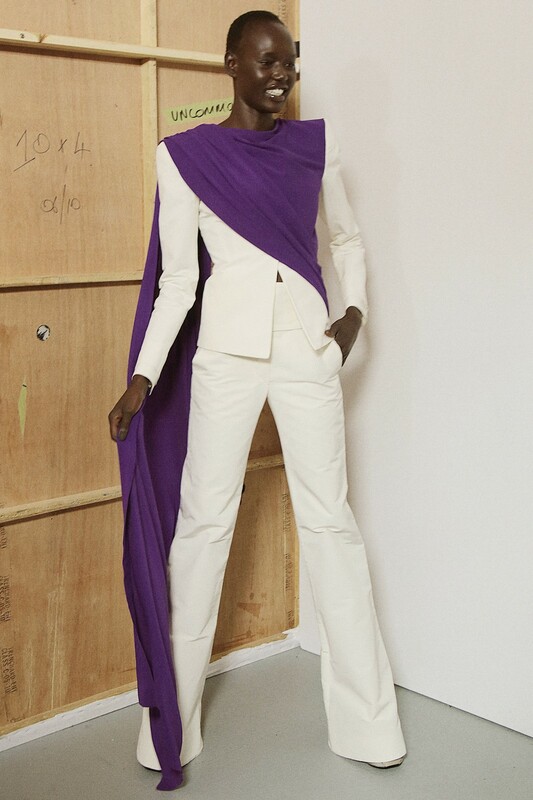 We seem to be experiencing the cultural phenomenon of artifice in its most terrifying form but, while last season’s Gareth Pugh collection explicitly documented the sinister side of the contemporary climate, S/S17 was a triumphant celebration of authenticity. Staged the day after the opening of opera Eliogabalo at the Palais Garnier, for which Pugh designed the costumes and which thus directly inspired the collection, there was an essential purity to it all; while the precise tailoring and structured corsetry most typically associated with Pugh’s aesthetic played an integral role, there was also floating silk chiffon and remarkably natural fabrics (even the appearance of a couple of kaftans). While the show could simply have appeared a harsh condemnation of excess, or a dark reflection of the current political landscape, there was a determined grace and fluidity to what Pugh presented that served as a beacon of creative optimism: an active alternative to the moping it's so easy to settle into. The opening of the show bore a direct parity to the pieces that had debuted the previous evening – there were floating black orbs suspended above thrones to represent the insatiability of greed, splendid stiff tunics decorated with fractured, shimmering appliqué – but then, something shifted. It was as though we were arriving at the end of the story, as if Eliogabalo’s reign had crescendoed into chaos right at the start and, from its ashes, something more elemental emerged. The austere silhouettes of the opening looks gave way to feminine Grecian dresses that danced around the body and left trails of floating fabric in their wake; sharply-cut shattered bullion was replaced by patterned sunbursts and silver-threaded raffia. By the close of the show, that same orb that was previously “the ultimate symbol of insatiable hunger and consumption” was transformed into something determinedly energetic and, rather than succumbing to the horror that can engulf us, the show infused positivity into its audience. 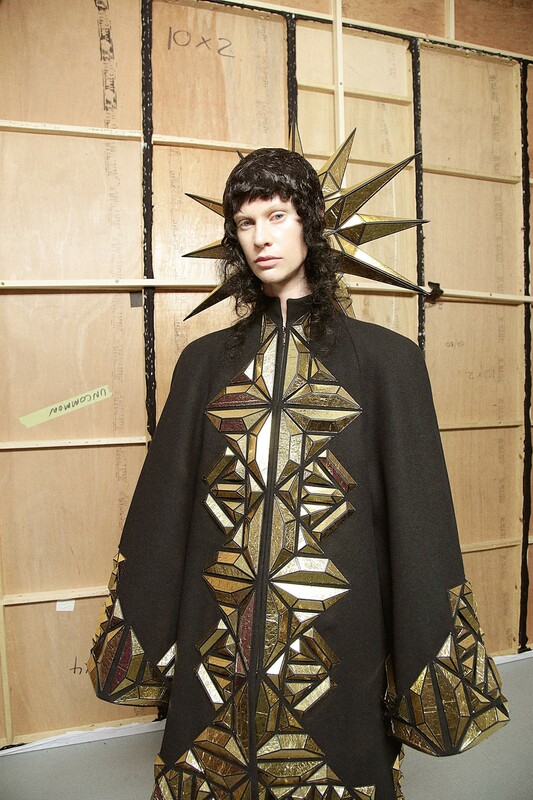 This flare was part of an ongoing conceit of radiance: there were, of course, the graphic sunbursts, “a symbol of creation of warmth, an explosion of power and life” and Eliogabalo himself was a self-proclaimed sun-god, but there was also Val Garland’s remarkable application of make-up which, although clean and pure, appeared to light the models from within. As women walked onto the runway, they had an otherworldly glow; “we wanted it to feel urgent, tense and hypnotic,” she said. “It was like freedom fighter meets eco-warrior – if it was a movie, it’d be the new Mad Max,” said hair stylist Malcolm Edwards, “like, even though the hair was really nasty, it was polished.” That’s precisely what Pugh achieved here – by applying his renowned, dark refinement to something determinedly luminous, he not only made a fairly fabulous case for anarchic activism but equally propelled his signature aesthetic forwards. While some of the later silhouettes were simple – the aforementioned kaftans, the A-Line shift dresses – they were perfectly executed and resoundingly contemporary. “Working with the Palais Garnier, I wanted to bring a touch of modernity into a revered place,” he said – and it was clear that working within the confines of operatic rigour (corsetry becomes slightly trickier when you mustn’t restrict breathing capacity) not only paid off on that stage, but equally on this runway. The world at large has seemed a particularly bleak place recently, and while it would have been easy for Pugh to take the concept of Eliogabalo as a starting point for something destructive and ominous, he pushed himself into the realm of creation. Rather than simply condemning artifice, Pugh presented an elemental alternative, a celebration of innate beauty and organic warmth that wasn’t necessarily to be expected of him. There was a refreshing power in such an approach – one that could, and should, pervade far beyond the runway.